The top example is an approximation of an italic script. The nib is held at an angle to the line and the sharpness of the edges should be evident. The lower example is done with the nib edge parallel to the writing line, and is more printing than cursive. So, I was just wondering if people generally buy italic nibs without the intention to write italic script with them. Is italic script an unloved script? For me special grinded nibs are not limited to a specific script/alphabet. Iˋm also not a calligrapher who writes exactly (or even try to, or want to) in a predefined given Alphabet. I just enjoy different nib cuts, and do not care about such things. Of course an italic nib looks nice if used for any kind of italic like writing, but itˋs for sure not limited to a specific subset of writing style. Btw. Your writing looks awesome (as always), love it, both styles. Flex gets all the attention these days, doesn't it? I enjoy stubs and crisp italics in part because they mitigate my scrawl. I appreciate those who can produce formal calligraphy but have no great desire to do so myself. Are you saying I’m doing it wrong? If I'm using a cursive italic or stub nib, I always have the nib at 45 degrees, though my daily script is not actually italic. I do, reasonably often, try a bit harder to write true italic. Like catbert I find a stub or italic improves my writing. Partly because the increased line variation makes any writing look better, partly because I'm trying a bit harder, and partly because it slows me down. To me, owning fountain pens gives me the license to experiment and be free and have fun with different cuts. And I also agree with Ptero that David's handwriting is excellent. The only pen I bought because it had an italic nib was a Platignum Silverline. I bought it because I had never tried an italic nib before and this pen came with the entire set of italic nib inserts from fine to BB. I use this pen to write my standard school-learned hand. The nib seems to punch up the otherwise boring script of mine. I have purchased other pens with italic nibs but only for the pens; the nibs were secondary considerations. I like the looks of italic writing as well as the other example provided in the photo, but I don't want to take up calligraphy as a pastime, as I want to save practice time for music. I buy italics but use my personal script with them. Like catbert, they make my writing look better than it really is and adds flair without a lot of effort. I do tend to rotate my nib inwards (to the left) so it ends up being a somewhat italicized script. I have flex pens but have not mastered them enough to make my script look good. I subscribe to the catbert and KrazyIvan school and use them to make my daily writing look better . I cant the nib naturally having used Obliques for a bunch of years and do love my flex nibs but am into a really long learning curve as far as learning how to use them properly . Interesting comments all. Just to be clear, the OP is in no way intended as a criticism of anyone, and certainly not suggesting anyone is doing anything wrong. Regarding calligraphy: my attempt at italic styling is just an everyday hand rather than an effort to produce flawlessly proportional italic script (which I cannot do anyway). Some of my correspondents, if asked, will tell you that they occasionally receive letters written in this manner. It would take me hours to write such letters in a formal italic script. And now reading the comments I just realised that I've never really tried to write a 'normal' cursive text using an italic nib. Off to have a go right now! As an additional thought, based on replies, as the italic is intended to be used for italic script (in theory at least) what is a stub nib design for? Assuming that it has a specific purpose. Interesting point. Obliques encourage me to angle the nib in order to address the paper smoothly. Sidestrokes become more slanted to maximize line variation and avoid filling in counters (I write small), so the effect is a bit more italic though still mostly vertical. Weren’t stubs or 'signature stubs' intended to be a more user-friendly way to lend weight and character to one's mark than italics? They certainly help my chickenscratch look more intentional. That said, who now uses a music nib to write music? 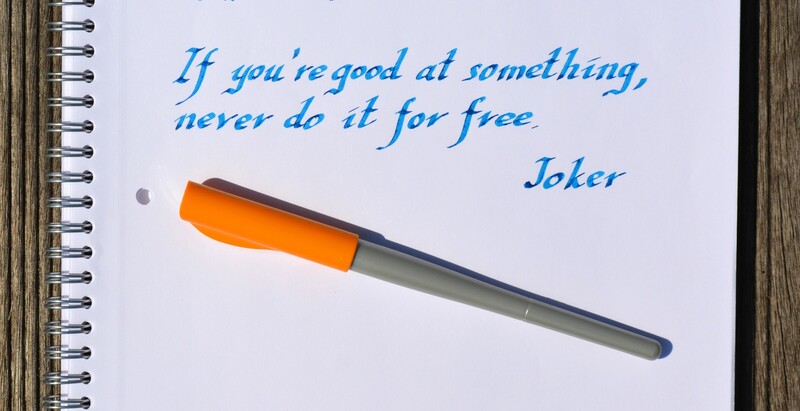 Put ink on paper in the way that suits you with the nib that suits you, regardless of its original purpose, if any. Isn't that the real point or purpose? We've been talking as if a nib with line variation 'should' (for purists) only be used for italic, that is, for a humanist script derived from the Italian renaissance. However, italic nibs can also be used for insular minuscule and uncial scripts. Where, if I remember correctly, the pen is held with the nib straight across, giving thick down strokes and very thin cross strokes. So, they're not just for italic, despite the name. And if you want to write a good Fraktur or textura hand, you'll also want a good thick nib. But I agree 100% with Penwash. If we wanted 'must' and 'should' and 'can't' and rules, we wouldn't get much fun out of our fountain pens. From the Pilot Parallel to the Platinum music nib, though Franklin-Christoph flex, the whole point of fountain pens is that there's so much variety to enjoy and so many inks to enjoy it with. Pilot Parallel pens are great, perfect italic nibs, affordable and a lot of fun. Btw. I saw that some calligraphers file their parallel pens that the flat front become curved on one side to achieve special writing behavior. Do anyone follow the “Calligraphy Masters” on YouTube? I do watch their videos from time to time, they are just amazing. And even I do not follow the calligraphy approach I admire their skill and how they master their pens. Last edited by Pterodactylus; December 9th, 2018 at 05:36 AM. I learned Tom Gourdie italic when I was young - a side project rather than at school - and the style has stuck with me. Gourdie has an emphasis on daily usability, recognising that speed is important, so it's been useful as a basis for my own semi-italic handwriting. I enjoy using italic nibs, but it's not essential, since I don't do formal italic. I'm not a huge fan of cursive, and even less when using an italic nib for cursive. The nib makes cursive too messy, adding emphasis where there shouldn't be emphasis e.g. when linking the tops of two 'o's. I won't stop people from doing it, though, and I've seen a few examples of handwriting that I've enjoyed despite those "flaws". ethernautrix, I love what you've done with that Pilot Parallel. I sometimes use an italic nib for cursive, but unless I modify my handwriting significantly, it makes it look worse, not better. What I do to make it look better when I write cursive with an italic nib is open up the letters, and make the loops in particular much larger than I normally would, almost like flourishes. Then it looks cool. I also sometimes use it for what I would normally use an edged nib on a dip pen -- not just italic but Foundational, blackletter, uncial, etc. But I find I like dip pens much better for calligraphy. Fountain pens make it too easy, like "driving" with an automatic transmission. Where's the fun in that? But mostly, I like the dip pen inks a lot better for calligraphy. Thanks Calamus, I might get in touch with Mike. I've been impressed by work he's done for me in the past, though it wasn't quite as adventurous as that. And I have a Franklin Christoph SIG flex nib coming in the post for Christmas, so that will be fun to try out. Love the 'ruined' Pilot Parallel! that's a lovely grungy style. Please can we get Alan Moore comics like Watchmen and V for Vendetta relettered with that style? It would be great! Lucky to get a SIG, not something I'm likely to see now that production has ceased. Writing samples in a day or two when I have better control of them.